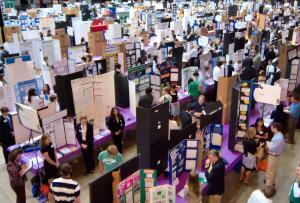 The California Science & Engineering Fair is the final science fair of the academic year for students throughout the State of California in grades 6 - 12, serving California's future scientists and engineers since 1952. The fair is hosted by the California Science Center. The 68th annual California Science & Engineering Fair will be held on April 29-30, 2019. That's only 3 days away! This year we expect 947 participants from 404 schools throughout the State who will present 801 projects in competition for awards totaling nearly $70,000. See this alphabetical list of participants as well as the list of all projects organized by division and category. Check for missing required items on this list of all participants organized by the student’s qualifying affiliated fair. For all qualified scientists and engineers who wish to judge at the 2019 Fair. Special thanks go to the following organizations for their generous donations and volunteer efforts. Haven't been to the Fair? Here are some of the photographs from the 2017 and 2016 Fairs taken by our photographer. For the historically-minded, here's a short photo essay using photographs taken about twenty years ago. Or watch the Awards Ceremonies again, just as they were then Webcast live from the Fair. Facilities for this Home Page have been donated by USC.